I'm back with a new post - finally! I know it has been a full month since I last posted - and what a busy month it was! But now we are back in our routine and even though I haven't posted, I have been doing a lot of cooking so I will be sharing all of those recipes with you over the next few weeks. The recipe I'm sharing today is another perfect quick and easy weeknight meal - don't we all need those? And with prep and total cooking time being less than 25 minutes, it's on your table faster than take-out. Another plus, and it's a big one - less sodium than take-out and you know exactly what is in it and how it was prepared. The original recipe called for ground turkey, but I changed that to pork - just a personal preference. I also used regular rice vinegar instead of seasoned. When rice is about 10 minutes from done, heat large skillet over high heat. Add the pork and sauté for 3-5 minutes until the meat is mostly cooked (if using ground pork, crumble the meat as you are cooking it). Stir in chili garlic sauce, hoisin sauce, and ginger. 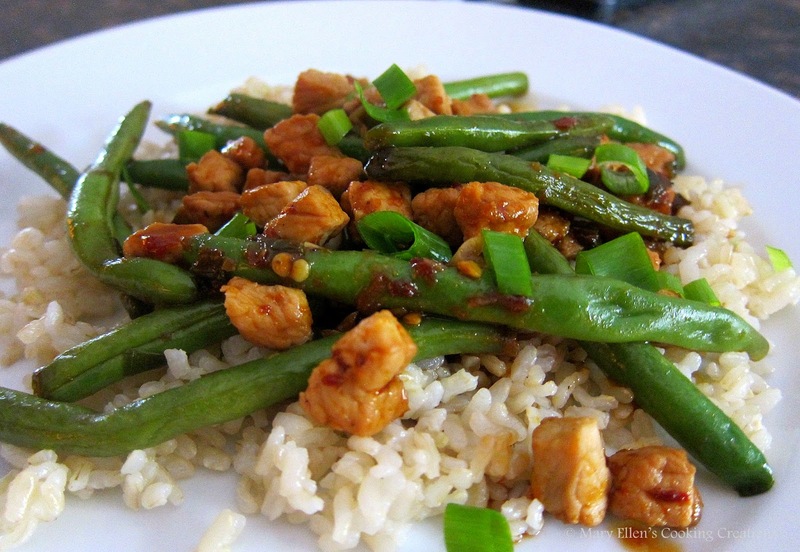 Add green beans and soy sauce, and stir to coat. Continue cooking over high heat for 7-9 minutes longer, stirring frequently, until beans are slightly tender. Stir in rice vinegar, and cook one minute longer. Serve over cooked rice. I do love a good take-out-fake-out!! This looks delicious, AND healthy.